Traumatic injury to the basilar artery may result from iatrogenic (1) or other uncommon causes. It can result in hemorrhage, ischemia related to local compression, occlusion (2), or false-dissecting aneurysms (3, 4). Basilar occlusion may also result indirectly from vertebral artery injury (5–7). Rare cases have been reported in which the basilar artery becomes incarcerated within a fractured clivus (8–10). In these reported cases, the basilar artery was completely occluded at the fracture site, leading to severe ischemia. We report a unique case of traumatic basilar artery herniation into the sphenoid sinus, with persistent patency of the herniated artery, despite transit through a clival fracture. A previously healthy 50-year-old construction worker presented after a 15-foot fall from a ladder. The patient had an initial Glasgow Coma Score of 6 upon arrival to the emergency department. His vital signs were stable. The initial neurologic examination demonstrated a fixed and dilated pupil on the left and a reactive pupil on the right. He had positive cough and gag reflexes. The upper extremities demonstrated no elicited response, and the lower extremities were in extension. The patient was admitted for further care and monitoring of his intracranial pressure (ICP), and an external ventricular drainage device was placed for ICP control. The patient was intubated, and subsequently, a tracheostomy tube was placed. The patient remained in the neurologic intensive care unit for 2 weeks and was then transferred to a skilled nursing facility 5 weeks following the initial admission. He continues to survive at the time of this writing. At 16-month follow-up, the neurologic examination revealed decerebrate posture and brain stem findings consistent with the locked-in state. 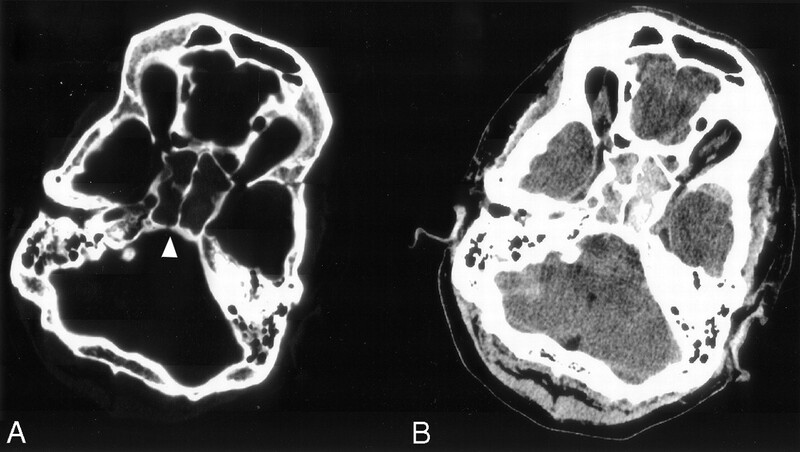 CT imaging of the brain on admission demonstrated a fracture of the left frontal bone with extension into the squamous portion of the left temporal bone. In addition, there were fractures of the lateral walls of both orbits and a nondisplaced fracture of the posterior wall of the right sphenoid sinus (clivus) (Fig 1A). A right mastoid fracture extended to involve the jugular foramen and the roof of the petrous bone. Blood was seen within the sphenoid sinuses, ethmoid air cells, and the left maxillary sinus. CT images viewed at soft tissue window on admission (Fig 1B) demonstrated an abnormal lucency involving the entire pons, extending to involve the pontomesencephalic junction. Patchy areas of high attenuation within the pons suggested petechial hemorrhage. In addition, there was diffuse subarachnoid hemorrhage within the suprasellar, interpeduncular, and perimesencephalic cisterns. MR images demonstrated abnormal T2 hyperintensity throughout the entire lower midbrain and pons, with some sparing of the periphery of the brain stem at the pontomesencephalic junction (Fig 2A). In addition, there was a focal area of abnormally increased T2 signal intensity along the superolateral aspect of the right cerebellar hemisphere and within the inferomedial thalami bilaterally. Fluid-attenuated inversion recovery (FLAIR) images (not shown) also showed linear increased T2 signal intensity within posterior frontal, parietal, and occipital sulci, confirming the presence of subarachnoid hemorrhage. Subarachnoid blood was also visible as T1 hyperintensity in the prepontine, perimesencephalic, and interpeduncular cisterns (Fig 2B). Diffusion-weighted MR images (Fig 2C) and apparent diffusion coefficient maps demonstrated restricted diffusion throughout the midbrain and upper pons, as well as along the right lateral aspect of the cerebellum, confirming the impression of acute infarction. The basilar artery was evident on routine axial T1- and T2-weighted MR images as a flow void focally displaced into the posterior aspect of the right sphenoid sinus. 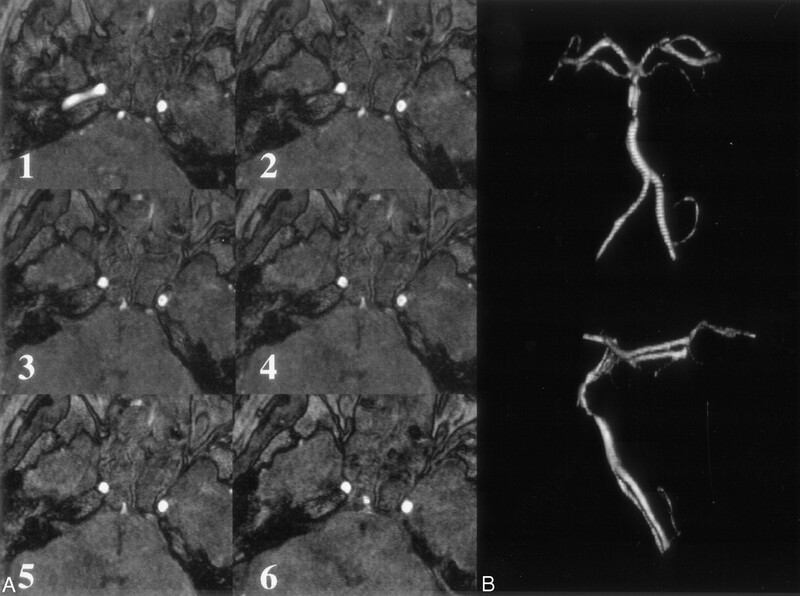 Three-dimensional time-of-flight MR angiography (3D TOF MRA) showed an unusual pattern of a patent but severely stenotic basilar artery, with focal anterior deviation of the midsegment of the basilar artery into the posterior aspect of the right sphenoid sinus (Fig 3). Correlation with axial CT studies revealed that the herniation of the basilar artery into the sphenoid sinus had occurred through a vertical fracture in the posterior wall of the right sphenoid sinus (Fig 1A, arrowhead). Careful review of the CT findings obtained at soft tissue windows actually demonstrates the herniated basilar artery outlined by denser hemorrhage (Fig 1B). Injury to the basilar artery may cause subarachnoid hemorrhage, parenchymal hemorrhage, or ischemia. We report a unique case of basilar artery herniation into the sphenoid sinus with persistent patency of the herniated artery, demonstrated by MR imaging and MRA. Trauma to the basilar artery may be iatrogenic, related to endoscopic third ventriculostomy (1), where a communication is created between the third ventricle and the prepontine cistern. The ventriculostomy through the floor of the third ventricle may injure the basilar apex, which is in close proximity to posterior recesses of the third ventricle. Traumatic injury of the basilar artery may also result in local compression or occlusion (2) or false-dissecting aneurysms (3, 4). Basilar artery occlusion due to distal thrombus propagation from an injured vertebral artery has been reported as well (5–7). Rare cases have been reported in which the basilar artery becomes incarcerated within a fractured clivus (8–10). In our patient, the basilar artery herniated into the right sphenoid sinus through a vertical clival fracture. CT findings in correlation with those of MR imaging and MRA clearly show the course of the basilar artery extending through the clival fracture and in and then out of the sphenoid sinus. Flow void persistence and MRA show severe stenosis but persistent patency of the herniated basilar artery. The 3D reconstruction of the TOF images (Fig 3B) clearly demonstrates the constriction of the basilar artery as it enters and exits the sphenoid sinus. This vascular insult resulted in infarction of the brain stem related to shearing and occlusion of paramedian pontine perforating arteries. The infarction of the lateral aspect of the right cerebellar hemisphere was likely due to compromise of the right anterior inferior cerebellar artery. The thalamic infarctions were most likely due to the compromise in the blood supply of the thalamoperforator branches of the posterior cerebral arteries, perhaps related to distal thromboembolization. The immediate development of neurologic deficits along with the radiologic findings suggests rapid onset of ischemia related to arterial entrapment. The basilar dural venous plexus, contained within the dura covering the posterior aspect of the clivus, is likely to be injured as a result of clival fracture. As a result, hemorrhage within the sphenoid sinus following a clival fracture may have its source from the basilar venous plexus, the basilar artery, the sphenoid sinus mucosa, or a combination of the above. This case report describes the clinical course and radiologic findings of a basilar artery herniation into the right sphenoid sinus through a traumatic vertical clival fracture. The radiologic findings are demonstrated by CT, MR imaging, and MRA. Other authors have reported basilar artery incarceration within a traumatic clival fracture (8–10); however, this case report is, to the best of our knowledge, the first to demonstrate a basilar artery herniation through a nondisplaced clival fracture with persistent patency. Furthermore, this report is the first MR imaging–MRA demonstration of a traumatic basilar artery injury. The imaging studies used in this report illustrate the basilar injury clearly. This case is an excellent example of the utility of MRA techniques in discerning traumatic cerebrovascular disease and illustrates the utility of vascular imaging in the face of post-traumatic cerebral infarction. Accepted after revision November 26, 2003.